UA 93's flight path on September 11, 2001, from Newark, New Jersey, to Stonycreek Township, Pennsylvania. Field near the Diamond T. Mine, a coal strip mine near Stonycreek Township, Somerset County, Pennsylvania, U.S.
United Airlines Flight 93 was a domestic scheduled passenger flight that was hijacked by al-Qaeda on September 11, 2001, as part of the September 11 attacks. It crashed into a field near the Diamond T. Mine in Stonycreek Township, Pennsylvania, near Indian Lake and Shanksville, during an attempt by some of the passengers to regain control, killing all 44 people aboard including the four hijackers. No one on the ground was injured. The aircraft involved, a Boeing 757–222, was flying United Airlines' daily scheduled morning domestic flight from Newark International Airport in New Jersey to San Francisco International Airport in California. The hijackers breached the aircraft's cockpit and overpowered the flight crew approximately 46 minutes after takeoff. Ziad Jarrah, a trained pilot, then took control of the aircraft and diverted it back toward the east coast of the United States in the direction of Washington, D.C. Although the specific target is not known, it is believed that the hijackers were intending to crash the plane into either the White House or the Capitol Building. After the hijackers took control of the plane, several passengers and flight attendants were able to make phone calls and learn that attacks had already been made by other hijacked airliners on the World Trade Center in New York City and the Pentagon outside Washington, D.C. Some of the passengers then fought the hijackers in an attempt to gain control of the aircraft. 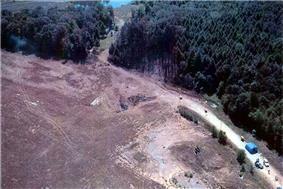 During the attempt the plane crashed into a reclaimed strip mine in Stonycreek Township, near Indian Lake and Shanksville in Somerset County, Pennsylvania, about 65 miles (105 km) southeast of Pittsburgh and 130 miles (210 km) northwest of Washington, D.C. A few witnessed the impact from the ground and news agencies began reporting the event within an hour. Subsequent analysis of the flight recorders recovered from the crash site revealed how the actions taken by the passengers prevented the aircraft from reaching the hijackers' intended target. Of the four aircraft hijacked on September 11 – the others were American Airlines Flight 11, American Airlines Flight 77 and United Airlines Flight 175 – United Airlines Flight 93 was the only one that did not reach its hijackers' intended target. N591UA taxiing on September 8, 2001, three days before it was hijacked. The hijacking of Flight 93 was led by Ziad Jarrah, a member of al-Qaeda. Jarrah was born in Lebanon to a wealthy family and had a secular upbringing. He intended to become a pilot and moved to Germany in 1996, enrolling at the University of Greifswald to study German. A year later, he moved to Hamburg and began studying aeronautical engineering at Hamburg University of Applied Sciences. While living in Hamburg, Jarrah became a devout Muslim and associated with the radical Hamburg cell. In November 1999, Jarrah left Hamburg for Afghanistan, where he spent three months. While there, he met with al-Qaeda leader Osama bin Laden in January 2000. Jarrah returned to Hamburg at the end of January and obtained a clean passport in February by reporting his passport as stolen. In May, Jarrah received a visa from the U.S. Embassy in Berlin, and he arrived in Florida in June 2000. There, he began taking flying lessons as well as training in hand-to-hand combat. Jarrah maintained contact with his girlfriend in Germany and his family in the months preceding the attacks. This close contact upset Mohamed Atta, the tactical leader of the plot, and al-Qaeda planners may have considered another operative, Zacarias Moussaoui, to replace him if he backed out. Four “muscle” hijackers were trained to storm the cockpit and overpower the crew, and three accompanied Jarrah on Flight 93. The first, Ahmed al-Nami, arrived in Miami, Florida, on May 28, 2001, on a six-month tourist visa with United Airlines Flight 175 hijackers Hamza al-Ghamdi and Mohand al-Shehri. The second Flight 93 hijacker, Ahmed al-Haznawi, arrived in Miami on June 8 with Flight 11 hijacker Wail al-Shehri. The third Flight 93 muscle hijacker, Saeed al-Ghamdi, arrived in Orlando, Florida, on June 27 with Flight 175 hijacker Fayez Banihammad. On August 3, 2001, an intended fifth hijacker, Mohammed al-Qahtani, flew into Orlando from Dubai. He was questioned by officials, who were dubious that he could support himself with only $2,800 cash to his name, and suspicious that he intended to become an illegal immigrant as he was using a one-way ticket. He was sent back to Dubai, and subsequently returned to Saudi Arabia. Ziad Jarrah and Saeed al-Ghamdi's passports were recovered from the Flight 93 crash site. Jarrah's family asserted that he had been an "innocent passenger" on board the flight. 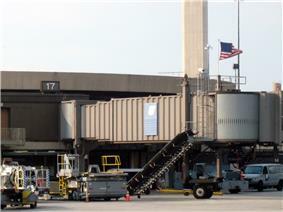 An American flag now flies over Gate 17 of Terminal A at Newark Liberty International Airport, departure gate of United 93. 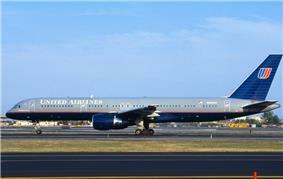 The aircraft involved in the hijacking was a Boeing 757–222, registration number N591UA. The airplane had a capacity of 182 passengers; the September 11 flight carried 37 passengers and seven crew, a load factor of 20 percent, considerably below the 52 percent average Tuesday load factor for Flight 93. The seven crew members were Captain Jason Dahl, First Officer LeRoy Homer, Jr., and flight attendants Lorraine Bay, Sandra Bradshaw, Wanda Green, CeeCee Lyles and Deborah Welsh. Haznawi and Ghamdi boarded the aircraft at 07:39 and sat in first class seats 6B and 3D respectively. Nami boarded one minute later and sat in first class seat 3C. Jarrah boarded at 07:48 and sat in seat 1B. The aircraft was scheduled to depart at 08:00 and pushed back from gate A17 at 08:01. It remained delayed on the ground and did not take off until 08:42 because of heavy airport congestion, just four minutes before American Airlines Flight 11 crashed into the North Tower. The three other hijacked flights all departed within fifteen minutes of their scheduled times. By the time Flight 93 became airborne, Flight 11 was four minutes away from hitting the North Tower and Flight 175 was being hijacked; Flight 77 was climbing normally and was nine minutes away from being hijacked. By 09:02, one minute before United Airlines Flight 175 hit the South Tower, the aircraft reached its cruising altitude of 35,000 feet (11,000 m). With the attacks unfolding, air traffic officials began issuing warnings through the Aircraft Communication Addressing and Reporting System (ACARS). Ed Ballinger, the United flight dispatcher, began sending text cockpit warnings to United Airlines flights at 09:19, 17 minutes after he became aware of the second World Trade Center impact by Flight 175. As Ballinger was responsible for multiple flights, he did not send the message to Flight 93 until 09:23, around 20 minutes after United 175's impact. Ballinger received a routine ACARS message from Flight 93 at 09:21. At 09:22, after learning of the events at the World Trade Center, LeRoy Homer's wife, Melody Homer, had an ACARS message sent to her husband in the cockpit asking if he was okay. At 09:24, Flight 93 received Ballinger's ACARS warning, "Beware any cockpit intrusion—two a/c [aircraft] hit World Trade Center". At 09:26, the pilot sent an ACARS message back, "Ed, confirm latest mssg plz —Jason". At 09:27:25, the flight crew responded to routine radio traffic from air traffic controllers. This was the last communication made by the flight crew before the hijacking. First mayday call at 09:28:17. Second mayday call at 09:28:50. The hijacking on Flight 93 began at 09:28. By this time, Flights 11 and 175 had already crashed into the World Trade Center and Flight 77 was within 9 minutes of striking the Pentagon. The hijackers on those flights had waited no more than 30 minutes to commandeer the aircraft, most likely striking after the seat-belt sign had been turned off and cabin service had begun. It is unknown why the hijackers on Flight 93 waited approximately 46 minutes to begin their assault. The flight suddenly dropped 685 feet (209 m) in half a minute. At 09:28:17, Captain Jason Dahl began shouting, "Mayday! Mayday! Mayday!" over the radio amidst sounds of violence. A Cleveland Air Traffic Controller replied, "Somebody call Cleveland?" but received no reply. Thirty-five seconds after the first Mayday call, the crew made another transmission. Someone in the cockpit shouted, "Mayday! Get out of here! Get out of here!" The exact time at which Flight 93 came under the hijackers' control cannot be determined. Officials believe that at 9:28, the hijackers assaulted the cockpit and moved the passengers to the rear of the plane at the same time to minimize any chance of either the crew or the passengers interfering with the attack. While the other hijacked flights were taken by five-man teams, Flight 93 had only four hijackers, leading to speculation of a possible 20th hijacker. The 9/11 Commission believes that Mohammed al-Qahtani was the likely candidate for this role, but was unable to participate as he had been denied entry into the United States one month earlier. With many passengers saying in phone calls that they saw only three hijackers, the 9/11 Commission believes Jarrah remained seated until the crew were overpowered and then took over the flight controls out of sight of the passengers. The flight recordings suggest that Dahl was still alive on the floor of the cockpit after the hijackers took over the plane, as sounds of moaning can be heard and the hijackers were rebuking someone in the cockpit. Dahl's wife believes that Dahl took actions to interfere with the hijackers, including putting the plane on autopilot just before the hijackers took over the plane, and rerouting the plane's radio frequency so that Jarrah's attempts to communicate with the passengers were instead transmitted to air traffic controllers. The cockpit voice recorder began recording the final 30 minutes of Flight 93 at 09:31:57. At this moment, it recorded Jarrah announcing, "Ladies and gentlemen: here the captain. Please sit down, keep remaining seating. We have a bomb on board. So sit." The controller understood the transmission, but chose to respond, "Calling Cleveland center, you're unreadable. Say again, slowly." A woman, presumably first-class flight attendant Debbie Welsh, is heard struggling with the hijackers before being killed or otherwise silenced, followed by one of the hijackers saying in Arabic, "Everything is fine. I finished." Jarrah instructed the autopilot to turn the plane and head east at 09:35:09. The aircraft ascended to 40,700 feet (12,400 m) and air traffic controllers immediately moved several aircraft out of Flight 93's flightpath. At 9:39, two minutes after Flight 77 impacted the Pentagon, air traffic controllers overheard Jarrah say, "Here's the captain: I would like to tell you all to remain seated. We have a bomb aboard, and we are going back to the airport, and we have our demands. So please remain quiet." Air traffic controllers did not hear from the flight again. Passengers and crew began making phone calls to officials and family members starting at 09:30 using GTE airphones and mobile phones. Altogether, the passengers and crew made 35 airphone calls and two cell phone calls from the flight. Ten passengers and two crew members were able to successfully connect, providing information to family, friends, and others on the ground. Tom Burnett made several phone calls to his wife beginning at 09:30:32 from rows 24 and 25, though he was assigned a seat in row four. Burnett explained that the plane had been hijacked by men claiming to have a bomb. He also said that a passenger had been stabbed with a knife and that he believed the bomb threat was a ruse to control the passengers. During one of Tom Burnett's calls, his wife informed him of the attacks on the World Trade Center and he replied that the hijackers were "talking about crashing this plane. ... Oh my God. It's a suicide mission." He began pumping her for information about the attacks, interrupting her from time to time to tell the others nearby what she was saying. Then he hung up. He ended his last call by saying, "Don't worry, we're going to do something." An unknown flight attendant attempted to contact the United Airlines maintenance facility at 09:32:29. The call lasted 95 seconds, but was not received as it may have been in queue. Flight attendant Sandra Bradshaw called the maintenance facility at 09:35:40 from row 33. She reported the flight had been hijacked by men with knives who were in the cabin and flight deck and had stabbed another flight attendant, possibly Debbie Welsh. Mark Bingham called his mother at 09:37:03 from row 25. He reported that the plane had been hijacked by three men who claimed to have a bomb. Jeremy Glick called his wife at 09:37:41 from row 27 and told her the flight was hijacked by three dark-skinned men that looked "Iranian", wearing red bandanas and wielding knives. Glick remained connected until the end of the flight. He reported that the passengers voted whether to "rush" the hijackers. The United air traffic control coordinator for West Coast flights, Alessandro "Sandy" Rogers, alerted the Federal Aviation Administration (FAA) Herndon Command Center in Herndon, Virginia, that Flight 93 was not responding and was off course. A minute later, the transponder was turned off, but the Cleveland controller continued to monitor the flight on primary radar. The Herndon Center relayed information on Flight 93 to FAA headquarters. Joseph DeLuca called his father at 09:43:03 from row 26 to inform him the flight had been hijacked. Todd Beamer attempted to call his wife from row 32 at 09:43:48, but was routed to GTE phone operator Lisa D. Jefferson. Beamer told the operator that the flight was hijacked and the pilots were on the floor dead or dying. He said one of the hijackers had a red belt with what looked to be a bomb strapped to his waist. A United employee in San Francisco, California, sent an ACARS message to the flight at 09:46, "Heard report of incident. Plz confirm all is normal." Linda Gronlund called her sister, Elsa Strong, at 09:46:05 and left her a message saying there were "men with a bomb." Flight attendant CeeCee Lyles called her husband at 09:47:57 and left him a message saying the plane had been hijacked. Marion Britton called her friend, Fred Fiumano, at 09:49:12. Fiumano recalled, "she said, 'We're gonna. They're gonna kill us, you know, We're gonna die.' And I told her, 'Don't worry, they hijacked the plane, they're gonna take you for a ride, you go to their country, and you come back. You stay there for vacation.' You don't know what to say—what are you gonna say? I kept on saying the same things, 'Be calm.' And she was crying and—you know—more or less crying and screaming and yelling." Flight attendant Sandra Bradshaw called her husband at 09:50:04 and told him she was preparing scalding water to throw at the hijackers. Passenger Lauren Grandcolas called her husband twice, once before takeoff and once during the hijacking. He missed both of her calls. She then passed her phone to Honor Elizabeth Wainio. Wainio called her stepmother at 09:53:43 and concluded, four and a half minutes later, by saying, "I have to go. They're breaking into the cockpit. I love you." Jarrah dialed in the VHF omnidirectional range (VOR) frequency for the VOR navigational aid at Reagan National Airport at 9:55:11 to direct the plane toward Washington, D.C. Bradshaw, on the phone with her husband, said "Everyone is running up to first class. I've got to go. Bye." The passenger revolt on Flight 93 began at 09:57, after the passengers took a vote amongst themselves about whether to act. By this time, Flight 77 had struck the Pentagon and Flights 11 and 175 had struck the World Trade Center towers. As the revolt began and the hijackers started maneuvering the plane around violently, the plane went off of its Washington, D.C. course. The hijackers in the cockpit became aware of the revolt at 09:57:55, exclaiming, "Is there something? A fight?" Edward Felt dialed 9-1-1 from his cell phone from the lavatory of the aircraft seeking information. His call was answered by dispatcher John Shaw, and Felt was able to tell him about the hijacking before the call was disconnected. Multiple news reports (originally based on a 911 supervisor's account after having overheard the call) asserted that Edward Felt reported hearing an explosion and seeing smoke from an undetermined location on the plane. These reports were not corroborated by Shaw or Felt's wife, Sandra, who listened to the recording afterwards. CeeCee Lyles called her husband once more from a cell phone and told him the passengers were forcing their way into the cockpit. Jarrah began to roll the airplane left and right to knock the passengers off balance. He told another hijacker in the cockpit at 9:58:57, "They want to get in here. Hold, hold from the inside. Hold from the inside. Hold." Jarrah changed tactics at 9:59:52, exactly when the South Tower began to collapse, and pitched the nose of the airplane up and down to disrupt the assault. The cockpit voice recorder captured the sounds of crashing, screaming, and the shattering of glass and plates. Jarrah stabilized the plane at 10:00:03. Five seconds later, he asked, "Is that it? Shall we finish it off?" Another hijacker responded, "No. Not yet. When they all come, we finish it off." Jarrah once again pitched the airplane up and down. A passenger in the background cried, "In the cockpit. If we don't, we'll die" at 10:00:25. Sixteen seconds later, another passenger yelled, "Roll it! ", possibly referring to using the food cart. The voice recorder did record the sound of the passengers using the food cart as a battering ram against the cockpit door. Jarrah ceased the violent maneuvers at 10:01:00 and recited the takbir several times. He then asked another hijacker, "Is that it? I mean, shall we put it down?" The other hijacker responded, "Yes, pull it down." Nevertheless, the passengers continued their assault and at 10:02:23, a hijacker said, "Pull it down! Pull it down!" The airplane descended with the yoke turned hard to the right. The airplane rolled onto its back, and one of the hijackers began shouting the takbir. Amidst the continued sounds of the passenger counterattack, the aircraft picked up speed, whooshing and shrieking picked up on the recorder, and then finally plowed into an empty field in Stonycreek, Pennsylvania, about 20 minutes' flying time from Washington, D.C. The last entry on the voice recorder was made at 10:03:09. The last piece of flight data was recorded at 10:03:10. The 9/11 Commission Report concluded that "the hijackers remained at the controls but must have judged that the passengers were only seconds from overcoming them." Some of the passengers' family members, having heard the audio recordings, believe that the passengers breached the cockpit and killed at least one of the hijackers guarding the cockpit door; some interpreted the audio as suggesting that both the passengers and hijackers struggled for control of the yoke. Kelly Leverknight, a local resident, was watching news of the attacks when she heard the plane. "I heard the plane going over and I went out the front door and I saw the plane going down. It was headed toward the school, which panicked me, because all three of my kids were there. Then you heard the explosion and felt the blast and saw the fire and smoke." Another witness, Eric Peterson, looked up when he heard the plane, "It was low enough, I thought you could probably count the rivets. You could see more of the roof of the plane than you could the belly. It was on its side. There was a great explosion and you could see the flames. It was a massive, massive explosion. Flames and then smoke and then a massive, massive mushroom cloud." Val McClatchey had been watching footage of the attacks when she heard the plane. She saw it briefly, then heard the impact. The crash knocked out the electricity and phones. McClatchey grabbed her camera and took the only known picture of the smoke cloud from the explosion. Ten years after 9/11, a video of the rising smoke cloud filmed by Dave Berkebile (deceased by 2011) from his yard located eight miles away from the crash site was published on YouTube. DNA recovery at the crash site. Flight 93 fragmented violently upon impact. Most of the aircraft wreckage was found near the impact crater. Investigators found some very light debris including paper and nylon scattered up to eight miles (13 km) from the impact point in New Baltimore, Pennsylvania. 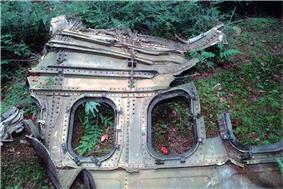 Other tiny aircraft fragments were found 1.5 miles (2.4 km) away at Indian Lake, Pennsylvania. All human remains were found within a 70-acre (28 ha) area surrounding the impact point. 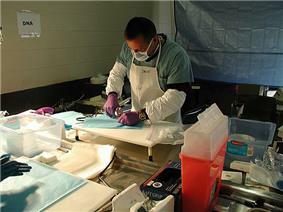 Somerset County Coroner Wally Miller was involved in the investigation and identification of the remains. In examining the wreckage, the only human body part he could see was part of a backbone. Miller later found and identified 1,500 pieces of human remains totaling about 600 pounds (272 kg), or eight percent of the total. The rest of the remains were consumed by the impact. Investigators identified four victims by September 22 and eleven by September 24. They identified another by September 29. Thirty-four passengers were identified by October 27. All the people on board the flight were identified by December 21. Human remains were so fragmented that investigators could not determine whether any victims were dead before the plane crashed. Death certificates for the 40 victims listed the cause of death as homicide and listed the cause of death for the four hijackers as suicide. The remains and personal effects of the victims were returned to the families. The remains of the hijackers, identified by the process of elimination, were turned over to the Federal Bureau of Investigation (FBI) as evidence. Investigators also found a knife concealed in a cigarette lighter. They located the flight data recorder on September 13 and the cockpit voice recorder the following day. The voice recorder was found buried 25 feet (8 m) below the crater. The FBI initially refused to release the voice recording, rejecting requests by Congresswoman Ellen Tauscher and family members of those on board. The FBI subsequently allowed the relatives of the Flight 93 victims to listen to the recording in a closed session on April 18, 2002. Jurors for the Zacarias Moussaoui trial heard the tape as part of the proceedings and the transcript was publicly released on April 12, 2006. First Lady Michelle Obama and Former First Lady Laura Bush survey the site of the Flight 93 airplane crash in Stonycreek Township, Pennsylvania, September 11, 2010. Since it never reached a target, the exact place intended to be hit by Flight 93 has never been decisively confirmed. Before the attacks, Khalid Sheikh Mohammed, Osama bin Laden, and Mohammed Atef developed a list of potential targets. Bin Laden wanted to destroy the White House and the Pentagon. Sheikh Mohammed wanted to strike the World Trade Center and all three wanted to hit the Capitol. No one else was involved in the initial selection of targets. Bin Laden told 9/11 planner Ramzi bin al-Shibh to advise Mohamed Atta that he preferred the White House over the Capitol as a target. Atta cautioned bin al-Shibh that this would be difficult, but agreed to include the White House as a possible target and suggested they keep the Capitol as an alternative in case the White House proved too difficult. Eventually, Atta told bin al-Shibh that Jarrah planned to hit the Capitol. Atta briefly mentioned the possibility of striking a nuclear facility, but balked after the other attack pilots voiced their opposition. Based on an exchange between Atta and bin al-Shibh two days before the attacks, the White House would be the primary target for the fourth plane and the Capitol the secondary target. 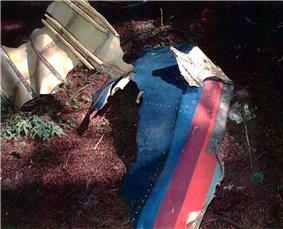 Debris of Flight 93 found at crash site. The United Airlines "Battleship Gray" livery used on the aircraft is clearly visible. Immediately after the attacks, there was speculation that Camp David was the intended target. According to testimony by captured al-Qaeda member Abu Zubaydah, U.S. officials believed the White House was the intended target. A post-9/11 interview with Sheikh Mohammed and bin al-Shibh by Al Jazeera reporter Yosri Fouda revealed that Flight 93 was headed for the Capitol. The 9/11 Commission Report cited the actions of the crew and passengers in preventing the destruction of either the White House or the Capitol. According to further testimony by Sheikh Mohammed, bin Laden preferred the Capitol over the White House as a target and Sheikh Mohammed revealed that the interview to Fouda was a lie to make the 9/11 attacks seem larger than they were. Salim Hamdan, bin Laden's driver, told interrogators that he knew the flight was headed for the Capitol. Two F-16 fighter jets from the 121st Fighter Squadron of the D.C. Air National Guard were scrambled and ordered to intercept Flight 93; the pilots intended to ram it since they did not have time to arm the jets. They never reached Flight 93 and did not learn of its crash until hours afterwards. One of several monuments at the temporary memorial. The North American Aerospace Defense Command (NORAD) insisted to the 9/11 Commission that fighters would have intercepted Flight 93 before it reached its target in Washington, D.C., but the commission disagreed, stating that "NORAD did not even know the plane was hijacked until after it had crashed" and concluding that had it not crashed it probably would have arrived in Washington by 10:23. The 9/11 Commission Report stated that NEADS fighters pursued Delta Air Lines Flight 1989, a flight thought to be hijacked. The commission found that NORAD and the FAA gave inaccurate testimony. In keeping with standard airline practice after disasters, the flight number “93” was discontinued by United Airlines after the hijacking. United has many nonstops from Newark to San Francisco. As of 2013, there is still an 8:00 A.M. flight from Newark to San Francisco, but is now Flight 497 using an Airbus A320. It was reported in May 2011 that United was reactivating flight numbers 93 and 175 as a codeshare operated by Continental, sparking an outcry from some in the media and the labor union representing United pilots. United said the reactivation was a mistake and said the numbers were “inadvertently reinstated”, and would not be reactivated. Panel S-68 of the National September 11 Memorial's South Pool, one of two panels that bear the names of United 93's crew and passengers. Two years after the attacks, federal officials formed the Flight 93 National Memorial Advisory Commission responsible for making design recommendations for a permanent memorial. A national design competition was held to create a public memorial in the Pennsylvania field where Flight 93 crashed. The winning design, "Crescent of Embrace," was selected out of a pool of 1,011 submissions on September 7, 2005. The site plan features a large crescent pathway with red maples and sugar maples planted along the outer arc. This design ran into opposition over funding, size, and appearance. Republican Congressman Charles H. Taylor blocked $10 million in federal funds toward the project as he saw it as "unrealistic." Republican Congressional leaders later persuaded him to acquiesce to political pressure and began approving some federal funds. The proposed design has also attracted critics who see Islamic symbolism in the crescent design. An important milestone was announced August 31, 2009, marking an agreement between the landowners and the National Park Service to allow the purchase of land for around 9.5 million dollars. 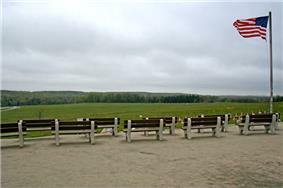 The memorial was dedicated on September 10, 2011, the day before the 10th anniversary of the crash of Flight 93. On August 9, 2007, a portion of U.S. 219 in Somerset County, Pennsylvania, near the Flight 93 National Memorial, was co-signed as the Flight 93 Memorial Highway. At the National September 11 Memorial, the names of the 40 victims of Flight 93 are inscribed on Panels S-67 and S-68 at the South Pool. ^ Kennedy, Helen (September 10, 2002). "Hijack Plot Bared On Al Qaeda Video". ^ "The Story of Ziad Jarrah". Canadian Broadcasting Corporation. January 19, 2005. Retrieved August 24, 2008. ^ a b "Hamburg cell reveals details". CNN. September 18, 2001. Retrieved June 22, 2008. ^ Freedberg, Sydney P (October 14, 2001). "He seemed like such a nice boy". ^ Fouda, Yosri and Nick Fielding (2003). Masterminds of Terror: The Truth Behind the Most Devastating Terrorist Attack. Arcane Publishing. p. 128. ^ Popkin, Jim (October 1, 2006). "Video showing Atta, bin Laden is unearthed". ^ a b c d "Al Qaeda Aims at the American Homeland". 9/11 Commission Report. National Commission on Terrorist Attacks Upon the United States. 2004. Retrieved July 2, 2008. ^ Fouda, Yosri and Nick Fielding (2003). Masterminds of Terror: The Truth Behind the Most Devastating Terrorist Attack. Arcane Publishing. p. 130. ^ "George Tenet's al-Qaida testimony". The Guardian (UK). October 18, 2002. Retrieved August 24, 2008. ^ a b "Chronology". Monograph on 9/11 and Terrorist Travel (PDF). National Commission on Terrorist Attacks Upon the United States. p. 40. Retrieved June 22, 2008. ^ Candiotti, Susann (September 19, 2001). "FBI returns to suspected hijacker's gym". CNN. Retrieved July 19, 2008. ^ Meek, James Gordon (January 29, 2004). I'll be back,' foiled hijacker told agent"'". Daily News. Archived from the original on January 29, 2004. ^ Sadler, Brent (September 17, 2001). "'"Uncle calls hijack suspect 'innocent passenger. CNN. Retrieved June 22, 2008. ^ a b c "National Transportation Safety Board: Flight Path Study – United Airlines Flight 93" (PDF). ^ a b c d e f g h i j k l m n o p q "Staff Report – "We Have Some Planes": The Four Flights – a Chronology" (PDF). ^ Bennett, Ronan (August 22, 2004). "Inside the mind of a terrorist". The Guardian (London). Retrieved June 22, 2008. ^ "Flight 93 Pilot's Wife Recalls Terror of Recording". ^ a b "'"Flight 93 hijacker: 'Shall we finish it off?. CNN. July 23, 2004. Retrieved June 23, 2008. ^ "Air Traffic Control Recording" (PDF). ^ a b c d e f g h "Summary of Flight 93". ^ a b c d e f "United Airlines Flight No.93 Cockpit Voice Recorder Transcript" (PDF). CNN. April 12, 2006. Retrieved July 4, 2009. ^ a b c "Timeline for United Airlines Flight 93". ^ Lewis, Neil A (April 13, 2006). "Final Struggles on 9/11 Plane Fill Courtroom". The New York Times. Retrieved August 24, 2008. ^ "Voices From the Sky"A Nation Challenged: The Tapes; . The New York Times. October 16, 2001. Retrieved August 24, 2008. ^ "Transcript of Jury Trial Before the Honorable Leonie M. Brinkema – United States District Judge Volume XVII-A" (PDF). United States District Court for the Eastern District of Virginia. April 11, 2006. p. 3477. Retrieved August 24, 2008. ^ a b c d e "Stipulation Regarding Flights Hijacked on September 11, 2001" (PDF). United States District Court for the Eastern District of Virginia. March 1, 2006. p. 9. Retrieved August 24, 2008. ^ "Relatives wait for news as rescuers dig". CNN. September 13, 2001. Retrieved June 23, 2008. ^ Lane, Charles; Don Phillips and David Snyder (September 17, 2001). "A Sky Filled With Chaos, Uncertainty and True Heroism". The Washington Post. Retrieved August 24, 2008. ^ a b Let's roll': A catchphrase that became a battlecry"'". The Age. Australia. September 9, 2002. Retrieved August 24, 2008. ^ Alderson, Andrew; Susan Bisset (October 20, 2001). "The extraordinary last calls of Flight UA93". The Daily Telegraph (UK). Retrieved August 24, 2008. ^ Hoffman, Ernie (December 7, 2001). "Dispatcher honored for Flight 93 efforts". ^ Spangler, Todd (September 12, 2001). "'Passenger makes frantic call before jetliner crashes in Pa.'". Bergen County Record. Retrieved March 23, 2014. ^ Longman, Jere (2002). "23". 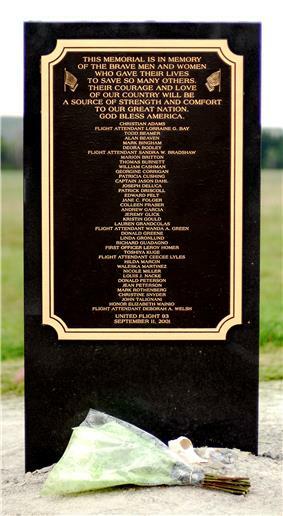 Among the Heroes: United Flight 93 and the Passengers and Crew Who Fought Back (1 ed.). New York: HarperCollins. p. 264. ^ "United Airlines Flight 93 – Flight Data Recorder" (PDF). National Transportation Safety Board. Retrieved June 29, 2008. ^ "Families of Passengers Question Theory That Hijackers Crashed Flight 93". ^ Emanuel, Mike; Liza Porteus and The Associated Press (April 13, 2006). "'"Flight 93 Hijacker: 'We Have a Bomb on Board. Fox News. Retrieved 10 September 2011. ^ "Wives of Passengers on Flight 93". ABC News. September 18, 2001. Retrieved 10 September 2011. ^ "'None of us will ever forget'". ^ "A Bell Tolls In Shanksville". ^ Kim, Won-Young; Baum, Gerald R. (2002). "Seismic Observations during September 11, 2001, Terrorist Attack" (PDF). Maryland Geological Survey, Maryland Department of Natural Resources. Archived from the original on March 20, 2003. ... we positively identified seismic signals associated with United Airlines Flight 93 that crashed near Shanksville, Somerset County, Pennsylvania. The time of the plane crash was 10:06:05±5 (EDT). ^ Longman, Jere (September 11, 2002). "Flight 93; Refusing To Give In Without A Fight". The New York Times. Archived from the original on April 8, 2008. Retrieved August 24, 2008. ^ Zapinski, Ken (September 12, 2001). "A blur in the sky, then a firestorm". ^ Sweeney, James F; Diane Solov; Rich Exner (September 12, 2001). "Pennsylvania crash carries horror into small towns". ^ Frederick, Robb (September 11, 2002). "The day that changed America". ^ Johns, Arlene (September 3, 2011). "Flight 93 Crash Site Video Surfaces". Retrieved September 6, 2011. ^ Black box' from Pennsylvania crash found"'". CNN. September 13, 2001. Retrieved June 29, 2008. ^ a b "Debunking the 9/11 Myths: Special Report". ^ Burger, Timothy J (August 17, 2002). 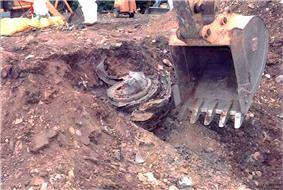 "Hijackers' remains FBI gets fragments of Pentagon, Pa. 9/11 thugs". ^ "Revised 9/11 Report Reveals New Details". Fox News. Associated Press. September 14, 2005. Retrieved August 24, 2008. ^ Shuster, David (September 12, 2006). "9/11 mystery: What was Flight 93's target?". ^ a b c "The Attack Looms". 9/11 Commission Report. National Commission on Terrorist Attacks Upon the United States. 2004. Retrieved July 2, 2008. ^ "White House target of Flight 93, officials say". CNN. May 23, 2002. Retrieved July 2, 2008. ^ "9/11 panel distrusted Pentagon testimony". CNN. August 2, 2006. Retrieved July 3, 2008. ^ "Bill Would Award Medals to Those Killed on Flight 93". Fox News. Associated Press. April 18, 2006. Retrieved August 24, 2008. ^ Grey's,' '24' among top Emmy nominees"'". CNN. July 6, 2006. Retrieved July 10, 2008. ^ Todd M. Beamer. Memorial Guide: National 9/11 Memorial. Retrieved October 28, 2011. ^ Pickels, Mary (July 2, 2008). "Flight 93 memorial work set after 4th". Pittsburgh Tribune-Review. Retrieved July 10, 2008. ^ "Secretary Norton Installs New Federal Advisory Commission for Flight 93 National Memorial" (Press release). ^ "'"To Honor 9/11 Heroes, Governor Rendell Signs Bill Designating Somerset County Road, 'Flight 93 Memorial Highway. WTHR. June 12, 2007. ^ About: The Memorial Names Layout. 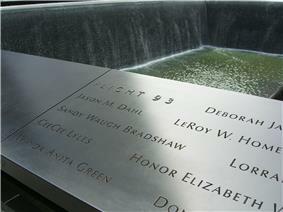 Memorial Guide: National 9/11 Memorial. Retrieved December 11, 2011. Lisa D. Jefferson and Felicia Middlebrooks. Called: Hello, This Is Mrs. Jefferson. I Understand Your Plane Is Being Hijacked. 9:45 am, Flight 93, September 11, 2001. Northfield Publishers, 2006. Jere Longman. Among the Heroes: The Story of Flight 93 and the Passengers Who Fought Back. Simon and Schuster, 2002.